Boss: What would you say was your greatest weakness? Boss: I don’t think that’s a weakness! Job applicant: Well, I don’t really care what you think. If you’re having problems, there’s a Thai translation on the following page. I don’t wear furs because I don’t like the idea of second hand clothes. There are quizzes to test your level of English using jokes. Little boy: (In garden) Excuse me, Mrs Jones, can I have my arrow back, please? Mrs Jones: Of course, Richard. Where is it? Little boy: In the side of your cat. Ready to buy เรื่องตลกภาษาอังกฤษ – ไทย? Which version do you need? 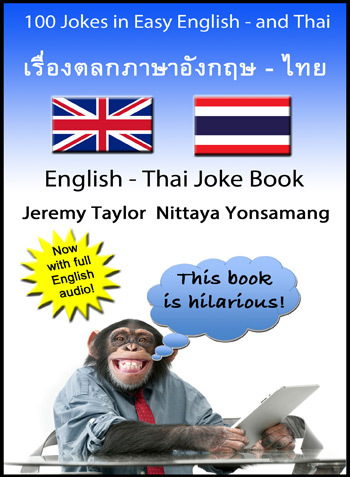 Thousands of people have downloaded the joke book which is available in a variety of formats but you need to choose the correct version for your device. (Don’t worry if you get it wrong, contact us and we’ll send you the correct version). If you don’t have an iPad, the book (without audio) is also available from Smashwords and Amazon.